Quimby the latest Lenape miler to break into all-time S.J. top 10! Stop us if you’ve heard this one before: Lenape has a fast miler. Sophomore Megan Quimby just missed breaking five minutes for 1,600 meters at the Meet of Champions on Saturday, placing second in 5:00.12. That makes her the third Lenape girl in the all-time South Jersey indoor top-10 and the fourth Lenape girl to run sub-5:04 indoors. Only four other South Jersey schools have had as many as two sub-5:04 milers indoors — Williamstown, Haddonfield, Cherokee and Washington Township. Only Cherokee has had three. Quimby’s time is No. 19 in the U.S. this winter and No. 4 among sophomores. Quimby focused mainly on the 800 as a freshman last spring, taking third in the Burlington County Open. She PR’d this winter with a 2:19.76 in a meet at the Bennett Center. Quimby’s 1,600 PR coming into indoors was a 5:20 from last spring, but she PR’d with a 5:05.79 at sectionals, a 5:05.34 at states and then the 5:00.12 at the Meet of Champions. She anchored Lenape’s U.S. #3 12:04.90 DMR at the Varsity Classic earlier this month with a 5:06.8 and also split 2:15 when Lenape ran its U.S. #4 4:08.21 SMR at the state Relays. Lenape will load up the DMR at Easterns back at the Armory earlier this month. Petela runs all-time S.J. #4 mile to win Meet of Champs!!!!!! Luke Petela keeps winning. And keeps getting faster. Petela, the Haddon Township senior, won the 1,600-meter run Saturday at the Meet of Champions in a personal-best 4:14.71, finishing 12 meters ahead of Colin Daly, a River Dell junior over the flat 200-meter track at the Bennett Center in Toms River. His time is No. 5 in the U.S.
Petela becomes the first boy from Haddon Township to win a Meet of Champions title indoors in 45 years, since the second year the meet existed, when Ken Medlin won the two-mile in 9:13.6. He’s also the first South Jersey M-of-C 1,600 winner since Erik Johnson of Ocean City in 2011 and the first from Camden County since Chris Platt of Haddonfield won in 2003. Petela’s time is No. 4 in South Jersey indoor history. Converting to 4:16.21 for a full mile, it’s fastest by a South Jersey runner in 12 years — since Platt’s 4:16.01 in 2003 — and trails only two legends — Cherokee’s Marc Pelerin and Cherry Hill’s Marty Ludwikowski. Petela, who is undefeated this year at 1,600 meters, lowered his PR more than two seconds from 4:16.95, which he ran at states. His time is the fifth-fastest winning time since the race was changed from a mile to a 1,600 in 1982 and the fastest time ever in the M-of-C by a South Jersey runner. On the overall all-time M-of-C indoor performance list, he’s No. 15 all-time. Ford Palmer does it again! Rips a PR 3:56 in 2015 indoor debut!!!!! Ford Palmer, shown here running for Monmouth. 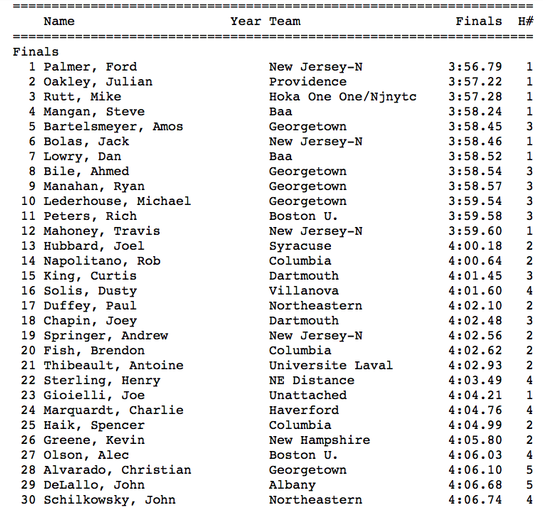 Ford Palmer opened his 2015 track season is style Saturday with a PR and the fastest time ever by a South Jersey native. 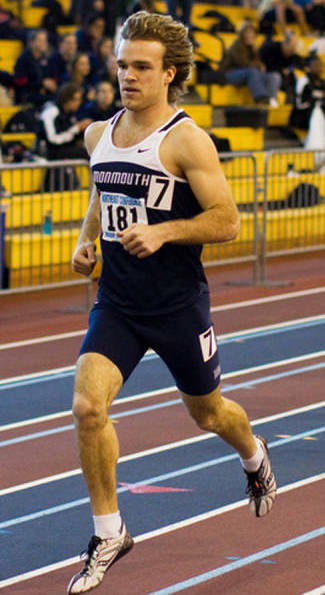 Palmer, a graduate of Absegami High School and Monmouth University, ran 3:56.79 to win over a loaded field at the Valentine Invitational at the Boston University Track and Tennis Center, in the process lowering the all-time South Jersey record. Palmer’s previous PR was 3:57.61, set in August at Meredith College in Raleigh, N.C.
Palmer’s time is No. 3 in the U.S. this year, behind only Ben Blankenship, who ran 3:53.13, and Riley Masters, who ran 3:56.15, both last weekend at the New Balance Indoor Grand Prix at the Reggie Lewis Center 2 1/2 miles away in Roxbury, Mass. It’s also No. 6 on the IAAF world list. 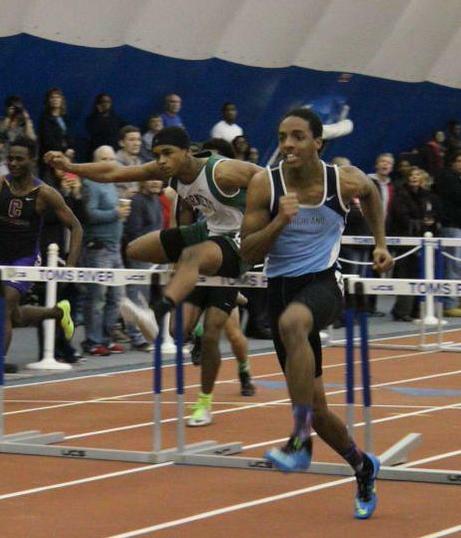 Highland’s Hill hurdles to #11 all-time NJ performance at states!!!!! Highland’s Chais Hill keeps climbing up the all-time New Jersey high hurdles list, and on Friday, he moved one step from the top 10. Hill PR’d for the second weekend in a row, running a blistering 7.34 to win the 55-meter highs at the state Group 2 meet at the Bennett Center in Toms River. Hill’s PR until this month was a 7.56 from when he won states last year. He lowered that to 7.50 in the finals at sectionals, then bombed a 7.34 in the finals on Friday. At a school that has produced a lot of terrific hurdlers over the years, Hill is now the fastest. And he’s No. 11 in state history, No. 8 in South Jersey history, No. 1 in New Jersey this year and fastest from Camden County in 14 years, since Dwight Ruff — who went on to star at Florida — ran 7.22 back in 2001. Hill is now just 2-100ths of a second from the all-time New Jersey top-10 and he still has the Meet of Champions, Easterns and nationals to go. Hill’s time is also No. 4 in the U.S. this year, behind Grant Holloway of Grassfield High in Chesapeake, Va. (7.23); Marcus Krah of Hillside High in Durham, N.C. (7.25); and Charles Graham of Phoebus High in Hampton, Va. (7.28). Interestingly, Hill wasn’t even the fastest qualifier out of the trials Friday. Nate Bowie of Matawan ran 7.53 in the second heat to Hill’s 7.61 in the third heat. But in the finals, Hill finished a whopping 2 1/2 meters ahead of second-place Rashaan Richardson of Pemberton, second in 7.74. Bowie ran third in 7.81. Hill also placed third in the 55-meter dash with a 6.60. Highland finished tied for third in team scoring with 23 points, behind River Dell (42) and Matawan (38) and tied with Delsea, with Hill scoring 16 of those 23 points. Highland was also fourth in the 4-by-4, with Josh Hackett, Joe Mazzie, Daquan Lindsey and Ryan Carroll running 3:33.15. Sean David scored in two events for Highland, taking sixth in the high jump at 6-0 and fifth in the high hurdles in 7.96. Gabrielle Farquharson, who had such a terrific career at Williamstown High School, is finishing her college career in style. Farquharson‘s indoor season is off to a terrific start both as a jumper and a sprinter. At the Penn State Invitational in State College, Pa., she PR’d with a 20-8 1/2 in the long jump, breaking the meet record of 19-9 set in 2009 by Gayle Hunter of Penn State. She also placed second in the 200 in 23.95, a school record. The previous mark was 23.98, set last year at ECACs by Asha Ruth. 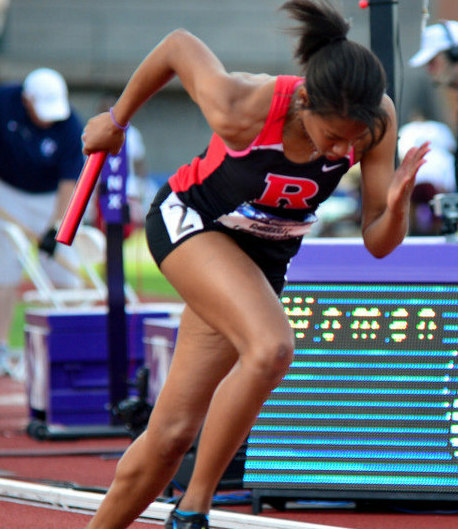 Farquharson contributed a leg on Rutgers’ 1,600-meter relay team, which ran 3:48.36. Bria Saunders, another New Jersey alum (Parsippany), was also on the 4-by-4 team. The versatile Farquharson also had a big meet at the Metropolitan Championships at the Armory this past weekend, winning the 60-meter dash, the 200 and the long jump. Farquharson ran 7.64 to win the 60, 24.17 to win the 200 and 19-9 1/2 to win the long jump. Farquharson is also No. 10 among all U.S. women in the long jump, according to the latest USATF performance list. The Scarlet Knights are in Boston Friday for the Valentine Invitational. Kingsway boys show crazy distance strength in winning SJ-3 title! 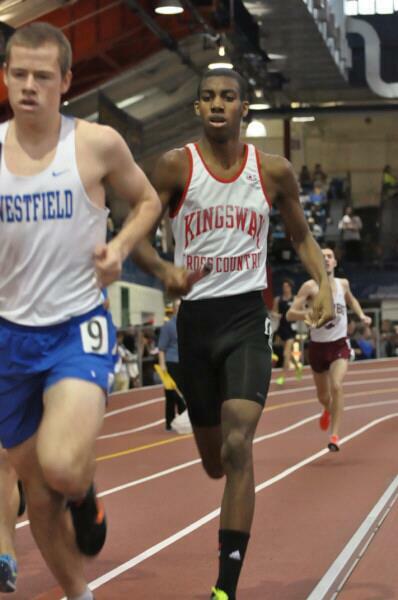 Noah Culbreath, shown here in an earlier race at the Armory, helped Kingsway win its third straight SJ-3 title. Sixteen points in the 800. Sixteen points in the 1,600. Sixteen points in the 3,200. Kingsway won its first indoor sectional title over the weekend, and it did it so in record-setting fashion. A huge part of the Dragons’ championship was a crazy performance in the three distance races. The Dragons ran 2-3-5 in the 800, 1,600 and 3,200, scoring enough points in just those three events to place third overall in the team standings. Seniors Trevor Culbreath (2:02.66), Myles Boerlin (2:02.67) and Noah Culbreath (2:02.77) did the damage in the 800, Noah Culbreath (4:27.32), Boerlin (4:32.88) and senior Kyle Evernham (4:33.05) handled the 1,600, and Evernham (10:04.74), Noah Culbreath (10:06.28) and freshman Joe Grandizio (10:08.34) took care of the 3,200 for Kingsway. Noah Culbreath, Evernham, Gandizio and Boerlin were the heart of the Kingsway cross country team, all placing in the top 20 at states, where Kingsway placed a close second to Cherry Hill East. But Kingsway scored in a lot of other places too on the way to a whopping 42-point margin of victory over Timber Creek. Kingsway scored 97 points, most ever in South Jersey Group 3 indoors since the inception of the indoor sectional meets in 2008 and also most ever by any Group 3 school in any group state-wide. So Kingsway has the top two Group 3 team scores in meet history in back-to-back seasons. Kingsway piled up 24 huge points in the pole vault, with senior Chad Shire (13-0) and sophomores Jacob Methany and (12-6) Ryan Evernham (12-0) sweeping the top three spots. So that’s 72 points in four events! The Dragons also got points from senior Jermaine Coleman, who ran third in the 55 in 6.76 after barely qualifying by 3-100ths of a second; from junior high jumper Chase Matthews, second with a 6-0 clearance; from shot putter Sam Shinn, second with a 51-4 1/4; and from the 4-by-4 team of Boerlin, Joaquin Cavazos, Jermaine Coleman and Noah Culbreath, fifth in 3:34.49. What a performance by the entire Kingsway team! Seneca overcomes disputed Webb DQ to win another sectional title!!!!! When junior Joey Webb was disqualified for interfering with another runner after winning the 1,600, things did not look good for the Seneca girls. In a tight meet like the South Jersey indoor Group 2 sectionals, you can rarely afford to just lose 10 points. Webb was first across the line in the 1,600 in 5:20-ish, but she was DQ’d for interfering with another runner along the final turn on the 200-meter Bennett Center track. Several coaches who witnessed the alleged infraction immediately came to Webb’s defense, explaining to meet officials that Webb had herself been accidentally jostled by another athlete and only interfered as a reaction to being interfered herself and losing her balance. Even the coach of the athlete who Webb supposedly interfered made it clear that Webb should not have been DQ’d. But the NJSIAA inexplicably has no appeals process for such calls, and the DQ stood. It could have been a deadly ruling for Seneca, but the Golden Eagles rallied and scored enough points to overcome the Webb DQ and win their third sectional title since 2009. Seneca got huge points in the 800 and shot put and clinched the team title by placing second in the 1,600-meter relay. Even without Webb’s 10 points in the 1,600, Seneca squeaked by Delsea, 53-50. Senior Kalyn Bryan threw a near-PR 33-6 3/4 for second in the shot and eight more big points. The Golden Eagles also got five points from junior Rebecca Bohi, who cleared 9-0 and tied for third in the pole vault; a point from freshman Carley Tool, sixth in the 3,200 with an 11:58.55; and one surprising point from freshman Samantha Derkas, who was the eighth seed in the hurdles final after a 9.60 but ran 9.38 for sixth. But the clincher was the 1,600 relay. Going into the 4-by-4, Delsea led Seneca 50-45, but Seneca ran second and Delsea didn’t place, and Seneca had its first indoor sectional win in five years. Senior Madison Chant, freshman Grayce Heinemann, junior Danielle LeSaint and Martin ran 4:10.73, finishing safely head of third-place Oakcrest (4:14.49) for second place. Delsea would have needed to place fourth to win the team title, and that would have taken a time of 4:18.19 or better. The Crusaders ran 4:20.16, finishing less than two seconds away from winning. It’s hard enough to win a meet like this against quality teams like Deptford and Delsea without a shaky officiating call. 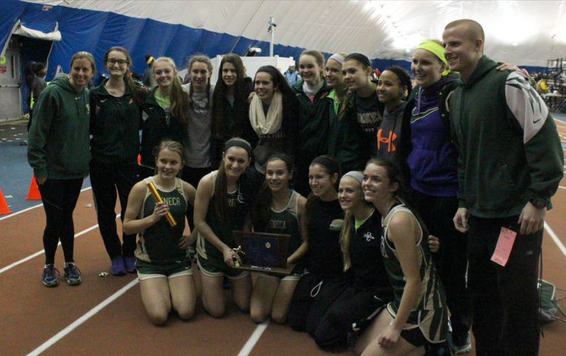 Seneca overcame a lot Friday to be the best in South Jersey Group 2!